One of my very best friends, Lisa Bartek, is a Realtor for the company I have worked for for the past 26 years. She stays in touch with her customers and clients by sending them cards that she creates. 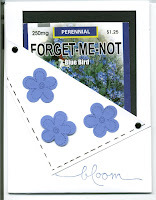 Since it is spring, she thought she'd send them seed packets of Forget-Me-Nots and stowed them in this very clever pocket card. She used a flower punch for the blue flowers. The added faux stiching on the fold-down was genious!!! I was thrilled with her card as will be all those lucky enough to receive it. Thank you, Lisa, for sharing this with us. Thank you for visiting today and come back again real soon!